Best-selling author and Secret Space Program researcher Bara brings us this lavishly illustrated volume on alien structures on Mars. Was there once a vast, technologically advanced civilization on Mars, and did it leave evidence of its existence behind for humans to find eons later? Did these advanced extraterrestrial visitors vanish in a solar system wide cataclysm of their own making, only to make their way to Earth and start anew? Was Mars once as lush and green as the Earth, and teeming with life? Did Mars once orbit a missing member of the solar system, a “Super Earth” that vanished in a disaster that devastated life on Earth and Venus and left us only the asteroid belt as evidence of its once grand existence? Did the survivors of this catastrophe leave monuments and temples behind, arranged in a mathematical precision designed to teach us the Secret of a new physics that could lift us back to the stars? Does the planet have an automated defense shield that swallows up robotic probes if they wander into the wrong areas? And are the lights still on down there, deep below the sands of Mars, just waiting for us to uncover them? New York Times Bestselling author Mike Bara examines all these questions and more in his new book ANCIENT ALIENS OF MARS. Chapters include: War of the Worlds; The Mars Tidal Model; The Death of Mars; Cydonia and the Face on Mars; The Monuments of Mars; The Search for Life on Mars; The True Colors of Mars and The Pathfinder Sphinx; more. 8-Page Color section! 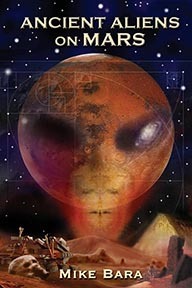 ANCIENT ALIENS ON MARS By Mike Bara. 282 Pages. 6x9 Paperback. Illustrated. References. Color Section.